Well it’s the start of a fresh new year and I have been contemplating our plans and goals. I use the term ‘plan’ rather loosely. You see, our approach to education is all about natural learning. That means we follow our children’s interests, there is no set curriculum, and no one is made to learn anything they’re not at all interested in. For anyone who hasn’t heard of natural learning or unschooling before, this can seem kind of crazy. Won’t the kids just play all day and not learn anything? Well hopefully, and no. As we found out last year, it works rather beautifully indeed. This year we’ll be picking up right where we left off. Ok, we never really left, there’s no terms or holidays here so we’ve been continuing on as usual. In 2015 I will have a 6 year old, a 4 year old, and a 1 year old. That means that technically my oldest would be in Grade 1, and my middle daughter would be in Kindy/Pre-School. It’s hard to have a ‘plan’ with learning, considering it is very interest-based and so instead of a plan I’ve been focusing on more of a ‘rhythm’. Last year with the arrival of our newest family member our rhythm went out the window for quite a while, which was to be expected. So this year I’m looking forward to feeling more organised. These are a few activities that I’ve set up in the play room the night before for the girls to find in the morning. I like doing this firstly because it gives us more sleep! And secondly, because if there’s nothing to do they usually switch the TV on instead. Our days start better if they’re already up and engaged in something when I get up with my youngest. Otherwise, they lounge around watching TV and are harder to get motivated to get up and dressed. When there’s things all ready to do it gives me time to wake up and get breakfast for my littlest (the big girls make their own breakfast). I then have time to do anything else I need to do in the morning because they’re busy on their own. The activities are only simple things, e.g. art materials set out, puzzles, loose parts, Spielgaben, small world play, paper at the easel, play dough, beading, or just toys presented in a different way. I set out 2 to 3 a night and it doesn’t take long at all. 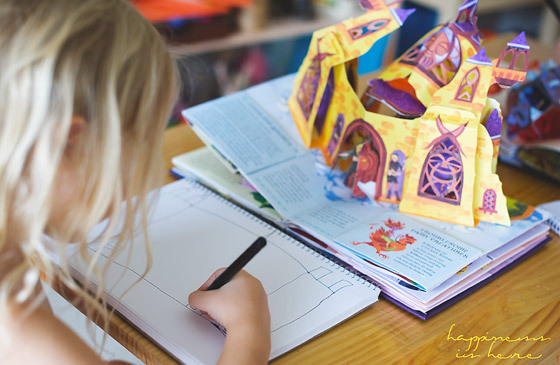 The term ‘project time’ comes from the book ‘Project Based Homeschooling‘ by Lori Pickert (which I would highly recommend). Though, we don’t use all the time marked above for what would actually be considered project time in the book. You will notice that we have project time (or art, etc) twice a day to coincide with when my 1 year old takes a nap. This is just a time for me to be fully present with the older girls. I go down into the playroom with them and get involved in or observe what they’re doing. If they’re not already engaged in something then it can become a time for working on their current projects. However, if they are already involved in play or working on something else then I won’t interrupt that to declare we must work on projects now, so it’s very flexible. I still sit with them and see what they’re doing, what they’re talking about, what they’re learning, and gather ideas for things we might explore more in the future. This year I’m trying to remember to document more so I’ll be doing a lot of taking notes during this time while I watch. 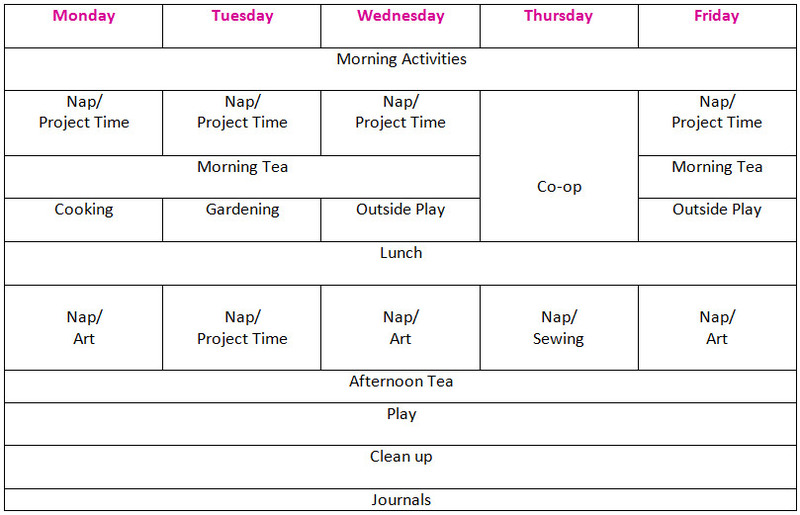 So, the ‘project time’ which you see in the time above could actually be project time, or it could be more play time, or they could be doing maths or reading or writing or any number of things! I really just couldn’t think of a better name for it but the main idea is that I am there with them, with no distractions, concentrating fully on what they/we are doing. This year I would like to do more cooking with the girls, so I have dedicated some time on Monday mornings for us to cook together some things that we can enjoy during the week. They love to cook and it’s great to teach so many things, especially maths. I’m typing up the recipes we make together and putting them all in a folder for them and hopefully by the end of the year they have a lot of things they can even make all by themselves. I’m hoping to get them more involved in helping with dinners too and maybe having one night a month where they cook a whole dinner themselves. The girls love having a little vegetable garden and their own flower garden to look after. This year I’d like them to learn more about it and have a set time they can dedicate to doing some work on it. There’s so much to be learnt from growing their own things and they have gotten so much joy out of it so we’re going to put in some more effort this year. Well, that’s pretty obvious isn’t it? We’ll also be including some sensory activities in here. 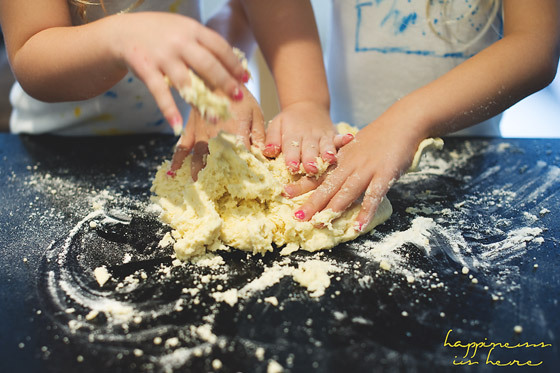 Miss 3 LOVES any kind of sensory play and we’ll be doing things that their little sister can enjoy getting her hands into as well. There’s always a lot of art in our week. If you’ve seen my post on our art shelves you’ll know my girls have free access to most art supplies. They are creating things at all times of the day. I’ve dedicated some other time to set out other art materials that require supervision, or to set up more intentional provocations. 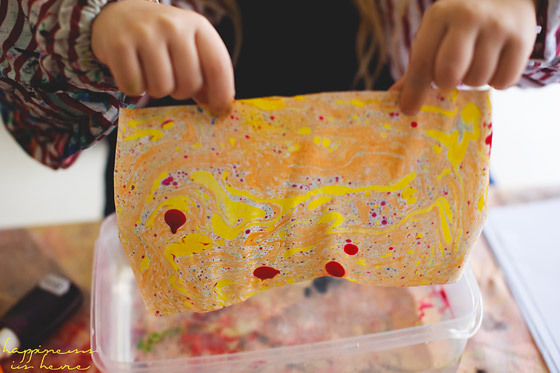 Art is a great way for them to represent their learning, or express themselves so we make a lot of time for it. Miss 5 has told me that she would like to learn how to use the sewing machine. So this year I’ve made some time for that. We’ll spend time designing things she wants to create and learning how to make them. Chances are Miss 3 will get involved as well. We will probably use this time later also for other things like knitting, weaving, etc. 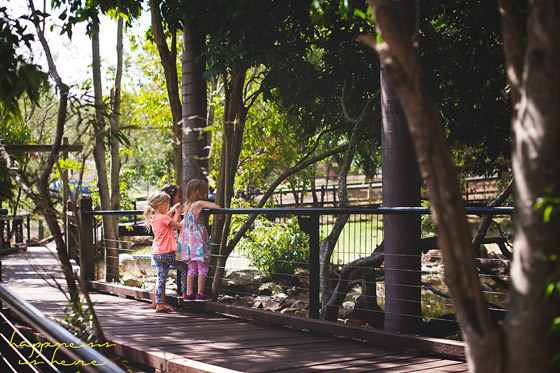 We have a fantastic co-op that provides lots of learning opportunities and excursions for the kids, but mostly they just love going to see their friends. We also meet up with friends for some fun outside every second monday, as well as other play dates during the week. The girls also do ballet lessons. Socialization… tick! And that’s it! After journal time we have our normal dinner, and bedtime routine which includes reading before bed. I’ve kept our days fairly simple and used my knowledge of what works for us and how our days usually flow. When I try to schedule too much in we never end up doing it all because my kids need plenty of time for free play. I think that’s the most important thing at this age and so I have left a lot of the day for them doing their own thing and coming up with their own plans. They currently still spend a lot of time in imaginary play. You’ll notice there’s no times listed at all because it’s really not so much of a routine but a rhythm. Some things do happen at predictable times, like meals, but others are a little different every day and we spend more or less time on things depending on how we feel that day. And the final test? Showing it to the girls to see what they thought of the ‘plan’. Miss 5 particularly likes having a loose routine and knowing what we’re going to be doing so she definitely approved and had a big smile on her face with everything I read out. Success! And what about the more academic things like english, maths, and science? Well, this year we do have to register as homeschoolers so I’ve also had a look at the curriculum and what we might have to cover. The curriculum is available online for anyone to see. I simply looked over it and wrote down points that I thought might be important or might come up this year, and also added in anything else that I thought was relevant. We covered so much through natural learning last year that my list is made up of points from grades 1-3. Most of these areas we cover naturally through their interests, or if they are particularly interested in maths or writing for example I will use project time to set up things for them to explore that area further. It’s really not that hard to cover everything you need to through life! And that is our week! There’s really not a lot to it. I’m sure it looks very similar to how other families days with young children might look, whether they homeschool or not. Natural learning/unschooling is not really any different to ‘life’. So much is unpredictable and up to chance. I can’t wait to see what new experiences we have this year and what interests are sparked in the children, that will really lead us, much more than any plan I could make will. I love what you are doing with your girls! Awesome. But I am curious what you will do when they are older. I recently started homeschooling as in two months ago. My boys are grades 3 and 6. So I have books to help them with math, science, grammar etc. I love the unschool concept but I haven’t figured out how to do that and still learn the essentials for this age group. I will take some ideas from you but I am thinking I cannot just let them have free play as they may not desire to learn fractions or reading comprehension? Sounds lovely Sara. Sounds very similar to ours although I will be using a Waldorf-inspired curriculum for part of our days this year so we’ll see how that goes and whether it suits us. I agree, it is so important for children to be able to pursue what interests them and not be forced to study something that is of little interest to them. I’ve tried to choose things which I think will interests the kids but you’re right, it needs to be flexible. I do like that you meet with your coop so regularly though. Ours is once a fortnight but I might see if some families would like to meet weekly. My son in particular has difficulty with social situations and so I need to make a very conscious effort to encourage him to play and interact with friends and other children. I am keen to see how the Waldorf curriculum goes Kate. Everything I’ve read about Waldorf just seems so lovely and beautiful and homely! I look forward to following along. Thanks so much for this! My son will turn 4 next month and I’m getting pressured to ‘do more’ with him. I’d love to find a co-op but most of the ones I’ve seen don’t start till 5, but we might do a little class like soccer or something else fun. Thanks again. Love your blog so much! Thanks Sarah! Co-op really is great, hope you find a good one near you. Sara, where did you get your play-dough tools? Love them! Oh boo. Shipping only in Aus. 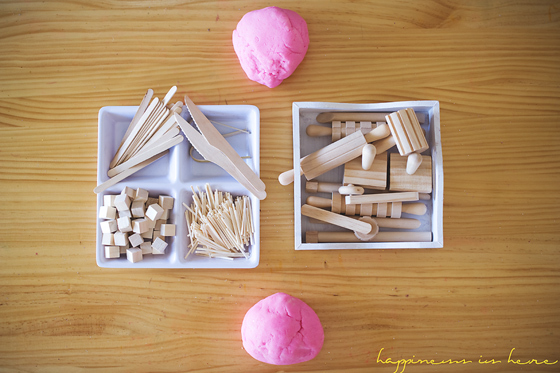 Well, I’m on the hunt for wooden play dough tools! I like your idea about having a few activities set out for them in the morning. I have the same issue that my oldest (4) will get up in the morning and want to do nothing but watch TV! I know that if I have more interesting things for him to do, TV is not such a temptation, but I hadn’t thought of having things prepared in advance for him. Thanks! I know this is quite a late reply to your post but I was hoping you could help me out with something. I can’t seem to get the balance right with screen time, if I give my five year old the power to choose when to have screen time and how much, he literally spends 80% of his waking hours watching Pokemon movies. We are looking to start natural based homeschooling with him some time this year (depending on home renovations) so I thought I would use the school holidays to ease off my control of screen time, but after about 4/5 weeks I couldn’t handle it anymore and have been commenting about how detrimental it is to his mood and health etc and have started putting a limit on how much he has each day. I know this may be discussed somewhere else on your blog, so if so please direct me there. Also I love love your blog, so inspiring and it looks as though you and your beautiful family enjoy a beautiful life. So THANKYOU for all your effort!! 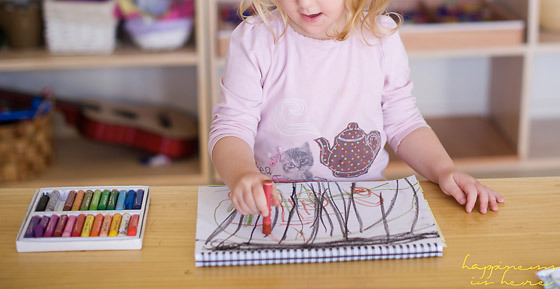 Where do you get your art easel that you have your Art book on for the girls? I love your blog and your set up. I have been following you for awhile and I’m making the transition to quitting my job and homeschooling my 4 children ages 9 – 9 months. Hi Sara! I was re-reading your post (I already read it 2 years ago but read it again today because my daughter is now 4 and we are starting to think about getting a bit more “organised” with our days) and I was wondering if you were still working like this now. This post was written 3 years ago and I was wondering if your rhythm or your way of organising your day had changed/evolved in anyway… Thanks for all the sharing and beautiful ideas and pictures, I love your blog! It is really inspiring!